While shopping this past week, I ended up buying a bunch of fresh dill. I’ve been wanting to incorporate dill into some of my recipes. Dill has this citrus, and maybe slightly sour aspect to it, and personally, I love it. I’ve tried growing it in my garden in the past, and it has never blossomed the way I wanted. I’ll admit that I have somewhat of a green thumb, but have failed when it comes to dill. Regardless, I can now get some fresh dill, and I’m fine with that. So, I decided to make a batch of tzatziki sauce. If you have never had tzatziki sauce, well, it is a must! I made a batch, only to be used for my Grecian lamb and grilled cheese sandwich (It was amazing). However, I had plenty of leftover tzatziki sauce. It was last Sunday, and after looking in my refrigerator, I also noticed I had some leftover chicken that I had roasted the previous night. 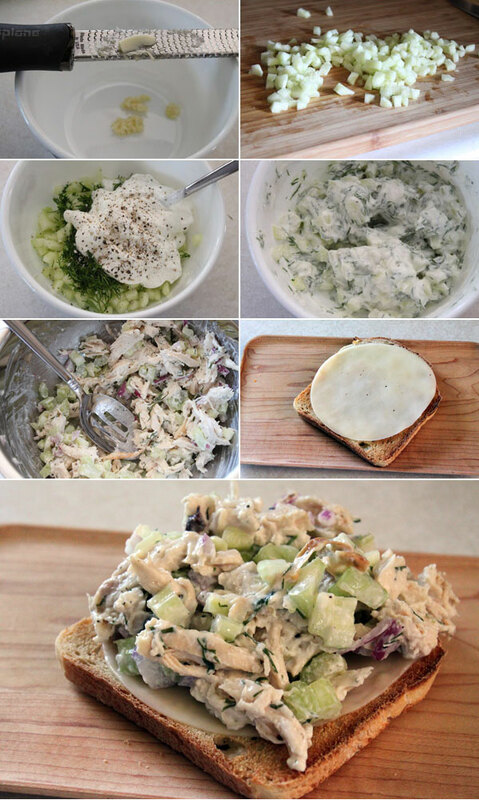 That’s when I thought of making a tzatziki chicken salad sandwich! Mix all of the chicken salad ingredients, with the exception of the bread, into a small mixing bowl. Take one of your toasted pieces of bread, and add the thin slice of provolone cheese. Generously mound some of the chicken salad onto the bread. Top with the remaining slice, and slice on the diagonal prior to serving. 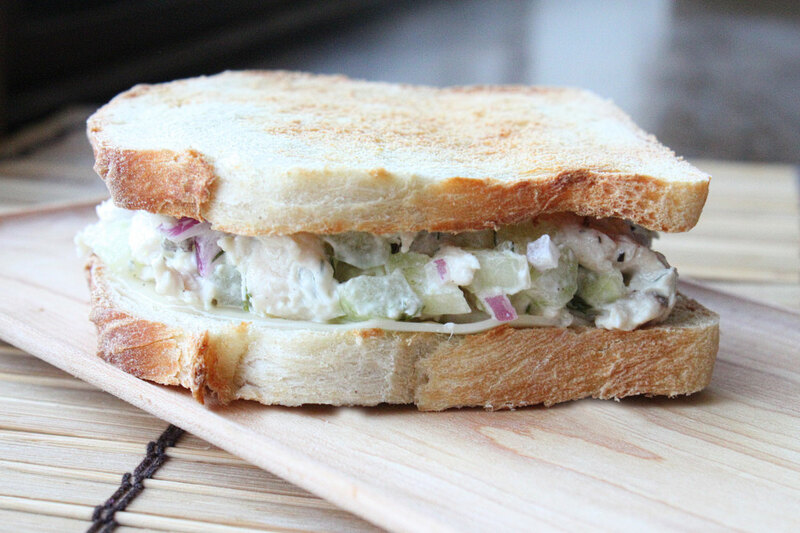 As you typically think of using mayonnaise in a chicken salad sandwich, the tzatziki sauce gives this an awesome surprise. Personally, I think the sauce with the cucumbers, dill, garlic, and yogurt really make this a better sandwich. You let me know what you think, as I thought this was a real winner.